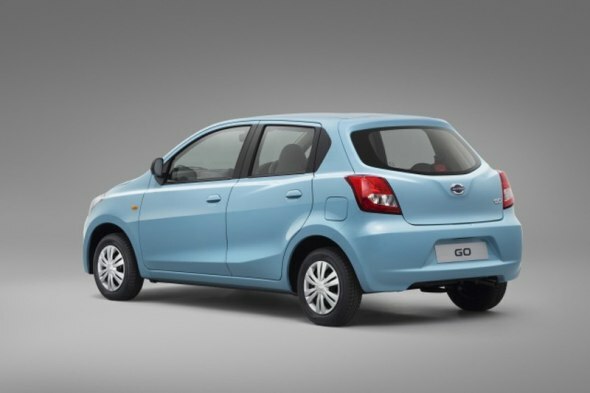 Snapshot: Shortly, Nissan India will launch the first car under its low cost Datsun brand, the Go hatchback. 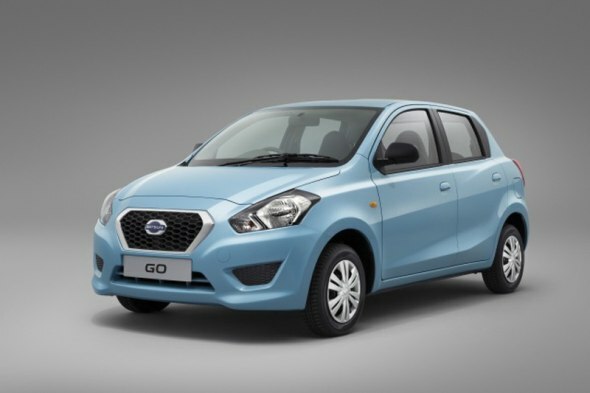 The Datsun Go will go on sale here in March 2014, when actual deliveries will happen. Production of the car has already kicked off at Renault-Nissan’s joint manufacturing unit at Oragadam, off Chennai. You can jump straight in to the video we’ve lined up for you after the jump to witness how the Datsun Go is being built. The Datsun Go hatchback is based on the Nissan Micra V platform. However, Nissan has pared down parts on the Datsun Go to meet the stiff price target of pricing all variants of the hatchback under the 4 lakh rupee mark. At that price level, the Datsun Go will be positioned as a spacious, low cost alternate to the likes of the Maruti Suzuki WagonR and the Hyundai i10 hatchbacks. The Datsun Go will be a petrol-only model. The car will use the same 1.2 liter petrol engine that is found on the likes of the Micra and the Micra Active hatchbacks. The state of tune of the 3 cylinder, HR12DE petrol engine will be similar to what is offered on the Micra Active. So, a 68 PS-104 Nm output is what the Datsun Go buyer will get. The 5 speed manual gearbox that drives the front wheels of the hatchback will be retained as it is. 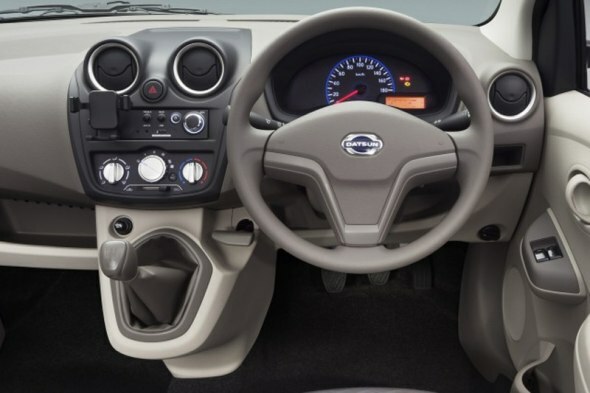 However, the gear shifter on the inside moves to the dashboard to liberate more cabin space. 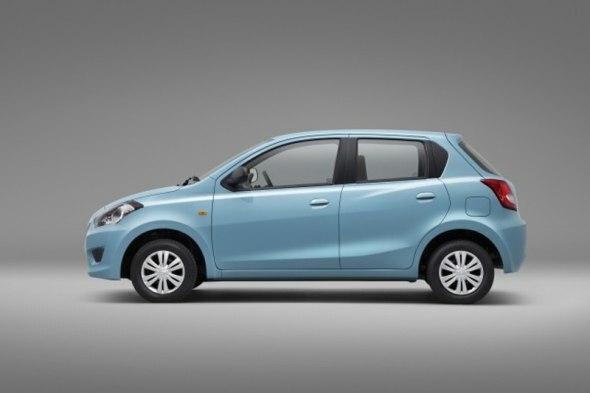 The unconventional bits on the Datsun Go stretches to the front seats, which is a flat unit like the ones that were found on the Hindustan Ambassadors and Premier Padminis of yore. Theoretically, 3 adults can be squeezed abreast into the Datsun Go’s front seat, motor safety be damned. The other unconventional is the low cost stereo that supports mobile docking. However, the stereo is an AUX only option, minus USB connectivity. Other low cost bits on the car include a rear view mirror without the anti-glare/night function, manually adjusting wing mirrors, pull and twist parking brake that was earlier seen on the Toyota Qualis MUV, non-lockable glove box and 13 inch steel wheels. Although many interior bits on the Datsun Go seem similar to the ones on the Micra, the plastics on the Go are said to be a few notches below that of the Micra in terms of quality and texture. The Datsun Go is likely to be lighter than the Micra. What to know what are Datsun’s plans for India after the Go hatchback’s launch? Click here to find out.